AshleyNewell.me: Hip Hop Hangover, I'm Psychic! Hip Hop Hangover, I'm Psychic! Happy Hip Hop Hangover Day aka Friday! We had a wonky hip hop yesterday since SCS decided to be crazy. But we still had fun! I have a couple cards to share with you today. This first card is for Wednesday's SCS sketch challenge. I used Tanis's house from the Unity January Kit of the Month, which I got by trading with my pal Jacquie. Seriously, how cute is this little house?? I thought it should be yellow and after much deliberation and chatting with some friend, the trim should be pink. I love pink! The pink card stock is Cuttlebugged with Swiss Dots. The designer paper is from Target (I love that $1 bin!) I actually matted the house on some DP too, it's a subtle green patterned paper. And I added some crystal effects to the windows and dew drops the corner of the card. I really like how this turned out! My next card fits a whole bunch of challenges which is one of the reasons that I'm so psychic. ;) Okay, really I'm psychic because I made this card yesterday and a bunch of the Unity DT members used this same set on their cards. It's Gratitude = Joy. I love this set! 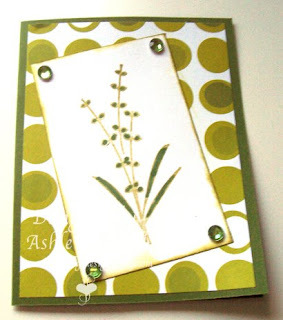 This card is for the Unity Addicts challenge to use green as a focus, the Limited Supplies challenge to make a card in under 30 minutes, and the Ways to Use challenge to make a card that's green. Way to multitask huh? Happy Friday everyone! Come back tomorrow for our EtsyInspired challenge with our first ever stamp company sponsor! I'm so excited! Love the how you mixed the green in with the pink! It looks great and that house is adorable! The green card is adorable too! So simple but yet so elegant and you got it right, way to multitask! I knew you were psychic!!!!! Must be those baby hormones working for you. I really think both your cards are great! Love the bling!!!! Have a great day and I'll see you later. I love that house. It's so adorable. Love these cards Ashley!! I love how you colored the house! Great triple challenge card!! oo Ashley I love these cards! I especially love the first one! 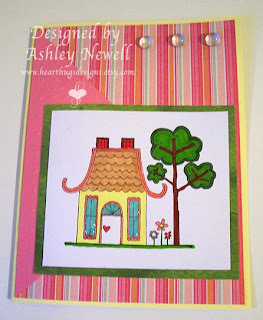 :) You colored that house so stinkin' cute! Very nice!! Really like the first one!! Cute cards! Love that little house! Wow, love those cards and your detail...that house is so so cute...I gotta have it too! Gee, Ash, all that green card needs is a tag and you really would've hit the multitask jackpot!! I think it's about perfect just as it is. And I love the house with its pink roof. Not only are you psychic, your a very creative head case!! LOL I love the colors you used on all of these - especially the house coloring. Nice! Fab I love them they are great! Love them both...but especially like the green card. That's one of my favorite sets. This is so cute, love this little house, and what a great job on the chanllenge. 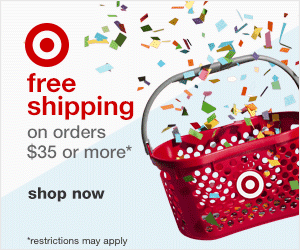 I love that house card I am glad you were able to trade for it!!! I really like the green card too cause well I love everything green!!! LOL!!! Well it might be cause it is a cool card too!!!! You always come up with great HHH projects to share!!! Not only you're psychic! You made awesome card!!!! I love them!!! These are wonderful Ash!!! I love the cheery house!!! And the green card is so beautifully elegant! !